Lightly spray both sides of chops with oil. Sprinkle evenly on both sides of chops. Grill over direct heat or broil 4 to 5 inches from heat for 8 to 10 minutes. Chops should be slightly pink in the center. 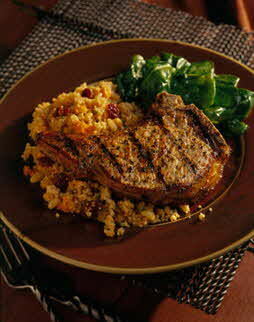 Simple version of a basic grilled chop. Marjoram's delicate flavor of oregano gives this dish a taste of the Mediterranean. Serve with a green salad and Countryside Couscous (in side dish category).